One of Western Australias most prominent Production Sedan drivers, Kane McDiarmid can not wait for this weekends MIXXFM, Speedway Sedans Australia, National Production Sedan Title, at the Western Speedway Hamilton. McDiarmid knows exactly how hard titles are to win, having never podiumed in a State Title, despite being at the forefront of Production Sedan racing within the state for near on a decade. However, the West Australian has twice finished on the podium at a National level, finishing second in Moora in 2016, and third at Wahgunyah in 2017. We have been working very hard for the last few months, to make sure that we have a package that is competitive enough to put us on the top step, but will need a touch of luck as always at a title, said McDiarmid. We have raced at Hamilton a couple of years ago, contesting the Victorian Production title, we were a little unlucky that weekend, but had good car speed, so we have a bit of an idea of where we need to be and what setup to run which is always helpful when you travel a long way, he added. After watching from the other side of the Country, McDiarmid was full of praise for the drive of fellow Sandgroper, Beau Riley, in the Victorian Title. The thing to take away from the Victorian Title is that Beau gets to bring the Vic 1 back home and I am stoked for him, that was a top effort and we were cheering him on from over west! The Victorian title showed that the names that always pop up will be at the pointy end, McDiarmid added. McDiarmid made an interesting assessment of the opposition this weekend, which augers well for a great weekend of racing. Trevor Mills has been the driver to beat for a few years now. I think WA are bringing some very quick cars! Kyle Sayer will be on rails, the Musarra brothers plus a Blight then throw in with the likes of Laidlaw and Berkley from Queensland it will be a big weekend, he adds. 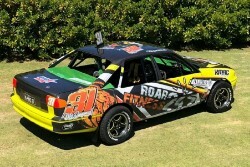 McDiarmid last raced over the new-year weekend at the prestigious Production Sedan Sizzle. We had a good shake down at the Production sizzle in Geraldton a couple of weeks ago and are happy with the preparation and hopefully will have most bases covered! Consistency is the key! Finish races and keep finding car speed! You can always look back and think what if I ran the top earlier or I made the car wider, but we are keen as ever to have a crack at the top step again!